Today at the PASS Business Analytics conference we announced the availability of new forecasting capabilities for Power View in Office 365. In Power View, you can now apply predictive forecasting, and hindcasting, when visualizing and exploring your data. Forecasting in Power View utilizes built-in predictive forecasting models using exponential smoothing to automatically detect seasonality in the data to provide forecast results from a series of data. Explore forecast results by adjusting the desired confidence interval or by adjusting outlier data to see how they affect results. You can also hindcast to see how Power View would have predicted the present and recent past based on older data. The best data for forecasting is time series data or uniformly increasing whole numbers. The line chart has to have only one line. Multiple-line charts won’t work, even if all but one line is filtered out. See more things to keep in mind about forecasting. Try hindcast to see how the algorithm performs in practice on your historical data. The forecasting in Power View performs advanced statistical analysis of your data to generate forecasts that incorporate trends and seasonal factors. Learn more about these methods and how to customize your forecasts to get the best results. Try the new forecasting capabilities of Power View today on your own data or with the sample report available as part of the Power BI report samples. 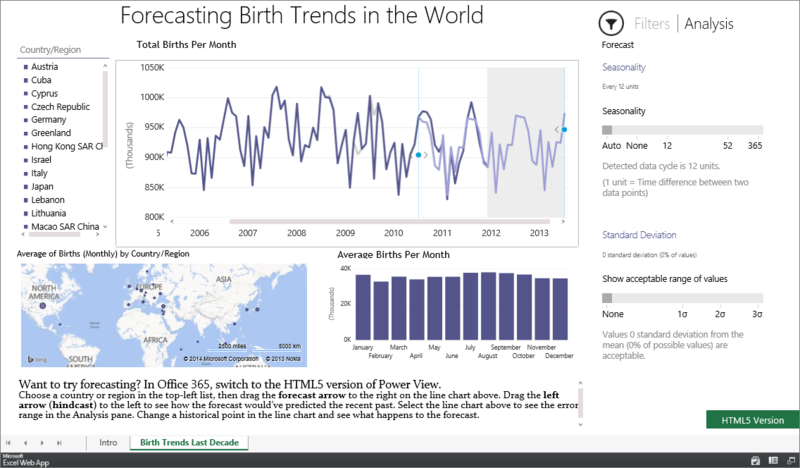 To view your own data, upload a workbook with a Power View time series line chart to Power BI for Office 365. Open the file in Power BI and switch to Power View in HTML 5 (choose Try the HTML5 version of Power View in the lower-right corner). Then click the forecast arrow or drag the forecast dot in the line chart, and you’ll see the forecasting options appear in the Analysis pane to the right of your report, as seen in the following image. Hindcasting shows how the forecast would’ve predicted the recent past, from the vantage point of the past. Now that you’ve got a forecast, you also see an arrow pointing left, at the beginning of the forecast. That’s the hindcast arrow. Click the hindcast arrow or drag the hindcast dot to the left to see how it would’ve predicted current values, if you had asked in the past. For hindcasting to work, the line chart needs a minimum of seasonality periods. Hindcasting is really a new and separate forecast, with its own seasonality and values in the Analysis area. Power View automatically detects what appears to be the seasonality of the data – in other words, a complete cycle of peaks and dips. For example, if you have high summer sales and low winter sales year over year, and you have daily data points, then the seasonality may be 365 – 365 data points in the one-year data cycle. You can override automatic seasonality detection. Start a forecast by dragging the forecast handle in a line chart. The Analysis Pane will automatically pop up on your right hand side. Can’t find it? Look for Analysis in the upper-right corner. In the Analysis area, manually set the seasonality to none, 2, 3, 4, 5, 6, 7, 12, 24, 52, or 365. 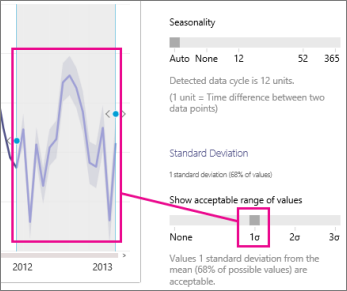 Tip : Seasonality works best if the chart has at least four times more values than the data cycle. For example, if you set the seasonality to 52, you’d want to have at least 4 times 52, or 208, values in the time series axis of your chart. The confidence interval shows visually how reliable the forecast is. Standard deviation is the setting for the confidence interval of forecast results. In the Analysis pane, adjust Standard Deviation to show values with a standard deviation of 0, 1, 2, or 3..
Line chart with one standard deviation. When you change data points in a line chart, the forecast changes based on the new values. You’re not changing the underlying data in the workbook or data source. Note : What-if analysis currently works only in Power View HTML5 with forecasting, and not in the Power BI app. Drag data point dots either up or down in the historical data to see how that changes the forecast. Drag the dot up or down. The line chart after dragging the dot down. To undo the change, double-click the data point dot. Forecast is available for line charts only. The x-axis value needs to have a date/time format or be a uniformly increasing whole number. It can’t contain text or decimal numbers. Sometimes x-axis values appear to be dates, but they’re actually formatted as text. They won’t work for forecasting. The chart has to have only one line. Multiple-line charts don’t work, even if all but one line is filtered out. The line chart has to have fewer than 1,000 values. Power View samples data in charts with more than 1,000 values, and forecasting won’t work on sampled data. The four most recent values in the time series must increase uniformly, meaning there’s the same length of time between each value. The interval between values has to be at least one day. Sometimes data has gaps in it—maybe a value is missing in a row, or maybe a whole row is missing. Power View fills in missing values before forecasting. Power View can add new values up to 100% of the existing values, so up to half the values in the line chart could be invented. If the chart has more missing values than that, Power View can’t forecast. A line chart contains all the values in the fields on the x and y axes. To limit those values, filter the line chart or filter the whole sheet. More about filtering in Power View. But filtering historical data may reduce the forecast quality. Filtering may also result in a chart with more than 50% of the values completed by Power View. If so, Power View can no longer create a forecast for that line chart. You can print the HTML5 version of Power View sheets, but the prediction and analysis doesn’t print. Undo (Ctrl-Z) doesn’t work. See Remove predictions for undo tips.